We are almost finished with a project that has taken over ten years to finish; within the next few days the fence around the Mwanza Bible College will be finished! It will be a time for celebration! There have been boundary disputes for years and through the years we have lost 1/3 of the original plot to squatters. However, after weeks and months of going to various government offices and paying various fees, the boundary for the Mwanza Bible College has been officially documented, all fees and compensations paid and the boundary clearly marked. The first job to building the fence was to dig a hole big enough to “cure”(soaking in water for several days) all of the cement posts that had to be made for the fence. In many places this task would have been finished in a day. At the Bible College it was a matter of a few weeks. Mwanza is built on boulders and rocks that often are as big as a house. Since we don’t have access to equipment such as bull dozers and other equipment to break up large boulders, it is done the way that it’s been done for generations here. You build a fire on top of the boulder, let it burn and when the rock cools it will have cracks in it. 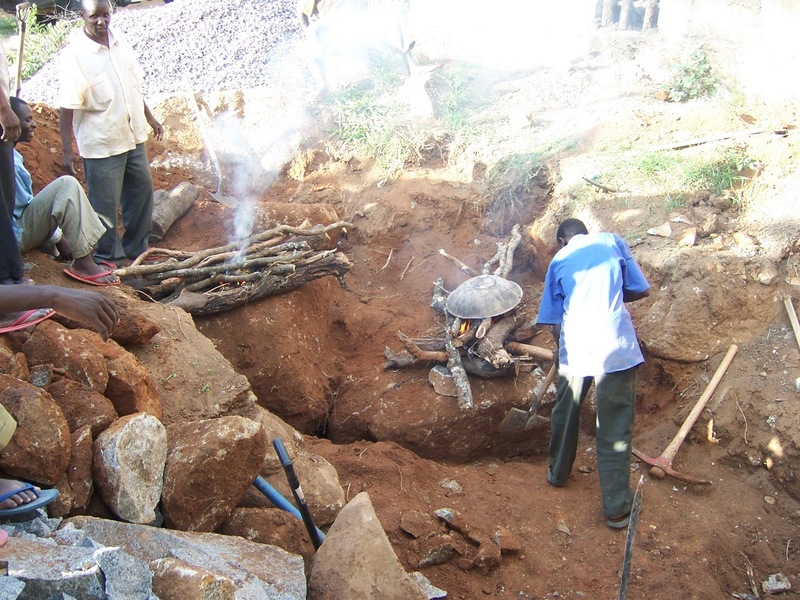 Then, with simple hand tools they begin the process of breaking the boulders into pieces that can be dug out of the ground and carried away. It is not a job for the weak or faint hearted; for Tanzanian laborers it is work they are accustomed to doing. These workers are partly students from the Bible College and from the local church. The hole will be used for an outdoor baptismal tank for the Bible College Church now that it has served it’s purpose for the fence building.